Here are a few more stories that I saw over the last few weeks, and thought might be of general interest, some concerned with antiquity, others less so. Another tweet alerts me that Sergey Kim has put online at Academia.edu here a new edition of the pseudo-Chrysostom homily “de remissione peccatorum” (the forgiveness of sins), together with a French translation. This is very welcome! 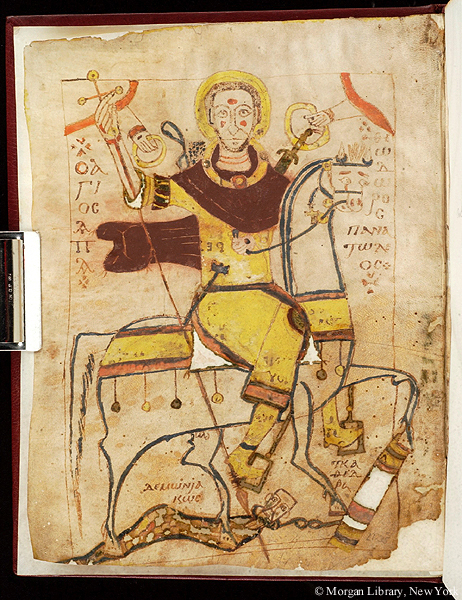 It also includes the editio princeps of a Bohairic Coptic version! Nessana is not a name that we associate with papyri. But while looking for information on St George, I came across mention of them – mostly documents of the community of Nessana in the early muslim period – here. There’s biblical papyri, texts of the Aeneid (! ), and a lot of hagiographical stuff. And, of course, documents with prices. The article gives some nice ideas of what things cost at that period. Quite a different story from Nile Green here, telling the story of a group of Persians sent to Britain to learn from western civilisation just after Waterloo. It must have been obvious to the Shah that the power of the west was becoming immense, and he understandably wanted to keep up. One of the students ended up at Cambridge, through the networks of connections through which Georgian England functioned, and came under the patronage of Samuel Lee. Lee is a figure that was already known to me. He was the editor and translator of the Theophania of Eusebius, after it was retrieved from the Nitrian desert in the 1840s. But before then, he was already famous as the “Shrewsbury linguist”, an ordinary man who had proven to have immense gifts for language. It was naturally to Lee that the Persian was entrusted. I did not know, however, that Lee was an enthusiastic Christian – why do secular writers always try to hide this behind terms like “evangelical”? – and generally a very worthy man. Of course as a professor, yet social outsider, he was perfect to assist the visitor. Buying books online? Beware the book-jacker! A couple of weeks ago I decided to buy the autobiography of rock keyboard player Keith Emerson, Pictures of an Exhibitionist. I was perplexed to see a series of copies offered for sale, starting at $100 and moving swiftly up. Then I learned about book-jacking. From what we’ve been able to piece together, there are about 40 “sellers” on Abe & Amazon … that do not own any of their own stock, but simply hijack other legitimate booksellers’ listings from other websites and then post the listings with inflated prices. After sifting the listings for the Emerson book, it looks like a classic example. There is perhaps one copy for sale, at a bookshop in London. The others are all get-rich-quick swindlers. Beware! Belying its simplicity and ubiquity, the price tag is a surprisingly recent economic development, Aeon magazine writes. For centuries, haggling was the norm, ultimately developing into a system that required clerks and shopkeepers to train as negotiators. In the mid-19th century, however, Quakers in the US began to believe that charging people different amounts for the same item was immoral, so they started using price tags at their stores to counter the ills of haggling. And, as this short video from NPR’s Planet Money explains, by taking a moral stand, the Quakers inadvertently revealed an inefficiency in the old economic system and became improbable pricing pioneers, changing commerce and history with one simple innovation. The medieval system of agricultural taxes where the (often poor) farmers paid the (often wealthy) rector a “tithe” of the crop was very obsolete in the 20th century, and greatly resented. In the 1930s the British Union of Fascists was active, and they chose to take up the case of farmers being prosecuted for failure to pay tithes. The political establishment didn’t like this at all; and the tithe system was quickly abolished. But I came across a photo of blackshirts in Norfolk confronting bailiffs. The page then has the very interesting story beneath. It’s here. 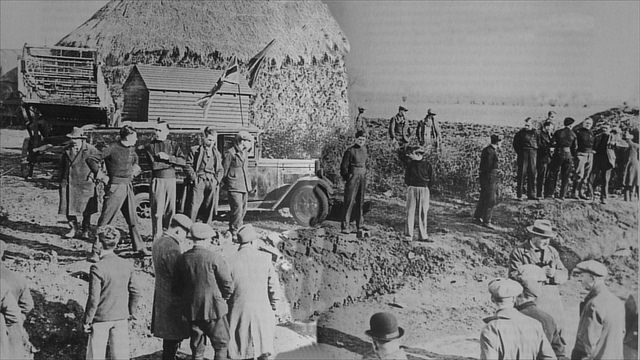 February 1934: BUF black shirts and farm workers defend Doreen Wallace’s Wortham Manor Farm from the bailiffs and the police. In 1934, Doreen Wallace and her husband Rowland Rash, who was from a long line of Wortham landowners, refused to pay their tithes for Wortham Manor farm. For sixteen days, some fifty members of the British Union of Fascists surrounded the farm to stop the court’s bailiffs gaining access to remove goods. They were confronted by lines of police drafted in from Ipswich, and then many were arrested on a technicality and carted off to prison in Norwich. On February 22nd 1934 the bailiffs entered and took £702 worth of goods. Doreen Wallace recalled in an interview many years later that the bailiffs had come down from Durham, as no East Anglian firm could be found to take on the job. The police had to intervene to stop the bailiffs lifting the piglets by ears and tail, a practice outlawed in East Anglia but apparently still acceptable in the north. The bailiffs had previously wanted the farm’s 1934 wheat harvest, but they couldn’t find any farmworkers for miles around who were prepared to take it in for them, a fact of which all East Anglians should be proud. The events are remembered by a memorial on the edge of the Wortham Manor Estate near to Wortham church. A few miles away across Suffolk, the Elmsett Tithe Memorial recalls a similar incident, in which possessions were seized from the home of a land owner in lieu of payments to the Church. It reads 1934. To commemorate the Tithe seizure at Elmsett Hall of furniture including baby’s bed and blankets, herd of dairy cows, eight corn stacks and seed stacks valued at £1200 for tithe valued at £385. Charles Westren, the farmer at Elmsett, had refused to pay his tithes to the church. After the seizure, he set up this monolithic concrete memorial on the edge of his land facing into the gateway of Elmsett church, so that anyone leaving a service would be reminded of the injustice of the system. Westren eventually emigrated to America during the Second World War.The legal abolition of the tithes system in England and Wales was set in motion after the War, the system coming to a final end in the 1970s, by which time very few tithes were still collected because of the cost of doing so. I never knew that ecclesiastical tithes were still being collected in the 1970s. The injustice with which they were collected in the 1930s is breathtaking. But, as parishioners and clergy of the US Episcopalian Church found in recent years, or even the presbyterian congregation of Tron church in Glasgow, the brass-faced determination of a certain sort of ecclesiastic, to tear whatever they can get out of the hands of others, even if they don’t need it, is far from dead, even today. My impression is that the system pretty much ceased to exist in the 1930s after the BUF started to make capital from it. And that’s your news round-up for now! I attach an annotated translation of the ‘fictional’ part of the Coptic acts of the Synod of Ephesus. I am currently preparing an annotated translation of a short Syriac text about Nestorius, which of course contains a different perspective (or ‘take’, as people say nowadays). Pboou is one of the Pachomian monasteries. The Egyptian text has suffered from the attention of hagiographers, who have introduced fictional sections like this one. So the story is not of historical value (although genuine documents from the synod are embedded in the text). All this material is useful to have online in English. We could do with much more synodical material accessible in this way. Who of us has ever read the Acts of Ephesus, or Chalcedon? Rather than a translation I have decided on a few notes instead. Isaac does appear in the History of the Patriarchs of the Coptic Church, but only briefly – this Life is much longer, but also hagiographical. It is translated from the text in the Patrologia Orientalis 11 (1914). Our thanks to Dr. Alcock for making this accessible! Anthony Alcock continues his series of translations from the Coptic. This new item consists of 10th century AD Coptic songs – folk-stories – which mention Solomon. Thank you, Dr A., for sharing this with us! A little while ago Anthony Alcock sent in a set of colophons – ending remarks – from Coptic manuscripts, which appear here. Through the zeal and providence of the God-loving brother Chael, the son of late Stephen the island farmer, the man of the plain which is north of Esna: he is responsible for the production of this book through his own labour and gave it to the monastery of Mercurius at Edfu for the salvation to provide reading materal about St John and Apa Pachomius so that Mercurius the General and victorious martyr, John the Baptist and forerunner of Christ and Apa Pachomius the archimandrite might call upon Christ on his behalf and bless him in this world and save him from the snares of the devil and wicked people and assist him in all things towards good. After the completion therefore of this life he will be worthy to have his sins forgiven and to receive his inheritance together with all the saints. So be it. Amen. Remember me, Theopistos, the lowly deacon, the son of Severus the archpresbyter of the monastery of St Mercurius at Esna. I wrote this book with my hand. Pray for me that God might forgive me my many sins, for they are indeed numerous. So be it. Written Emshir 16, indiction 15, AM 703, AH 376. Amshir is the Coptic month that starts on 8 February, AH (Anno Hegirae) is the Muslim era, so this manuscript was completed by the deacon Theopistos, son of Severus, on 24 Feb, 987 AD. Let us indeed remember him, as he requested; and thank Anthony Alcock for making these words accessible to us all. As ever, many thanks to Dr. A. It is really useful to have this material online and in English!